I’m fortunate enough to have a pretty nice financial portfolio and deciding what to do with that was a serious endeavor. It’s even more complicated when there are no children or a spouse to consider. I wanted to do something that would make a difference. I’d had a long and satisfying career in social work, enhanced by my advanced degree from the University of Wisconsin-Milwaukee. In fact, that master’s degree opened doors to better jobs, making it possible to amass this tiny fortune now under consideration. First, I contacted the UWM Foundation and met with their attorney and donor representative. They both helped me work out the details.I wanted to set up a scholarship for a non-traditional student, one who’d had a break in their education and one who already had some on-the-job or volunteer experience. I’d been a non-traditional student myself and knew those special challenges well. We glided through the paper work and my scholarship was established as a planned gift, meaning the foundation would inherit the remainder of my estate. But, then it hit me it would be really neat if I could start giving the scholarship now and even meet the recipients. The Yiddish word nachas, pronounced with a guttural inflection, (also spelled nechus, nochess and several other ways) was introduced to me by the donor representative, a kind and sensitive Jewish man. Doing this now, he said, would give me nachas, meaning pride and satisfaction in an accomplishment. I liked the idea of pride and satisfaction being my own reward; so, the rest seemed simple. I called my investment advisor and withdrew the amount required to endow the scholarship. Now, each year the Foundation awards what the fund earns. 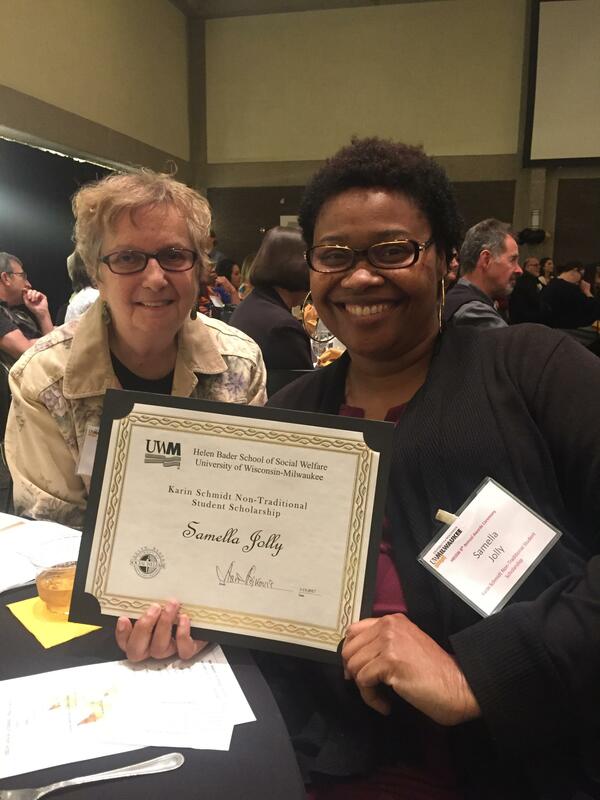 On Friday May 19, 2017, the Helen Bader School of Social Welfare at UWM held their annual award ceremony. For the first time, the Karin Schmidt Non-Traditional Student Scholarship, was awarded. My recipient, Samella, is 41 with a seventeen year old son; she has previously worked in several community health settings and was encouraged by her supervisor to apply to graduate school. The quintessential non-traditional student! Now, she has just two semesters to go before achieving her MSW in social work. I am so thrilled to be able to contribute to her success. During the event, I stood to whoops, whistles and applause as I was introduced as the 2016 Donor of the Year. How nice of the Dean to belatedly honor me since I’d missed last year’s program. That night, several faculty I didn’t know recognized me from my picture and a plaque that hangs in the School’s office. Another Jewish friend capped it off when she heard what I had done: what a mitzvah! she said. I had to look it up to know what she was saying. Mitzvah refers to the Jewish tradition to obey the command to do a good deed. By the end of the night I was feeling pretty good about myself. This event was truly a wonderful reawakening of memories from a high point in my professional career as a field supervisor for the School. I told Samella I’d never forget her since she was my first recipient. I was like a mom, basking in the joy of a child’s success. My mitzvah has given me plenty of nachas. adding one piece each time I pass.